Somewhere on that floor this past January, Carrie Gleason was rapt in conversation with a salesman from Workplace, a British firm whose software allows managers to optimize workers’ shifts hour by hour for maximum profit. She plied him with detailed questions, discovering in the process that the software can schedule only four weeks ahead, and that it really works best day-to-day. He walked her through both the worker-facing mobile version and the managers’ back end. When he tried to seal some kind of deal, Gleason explained a bit about the nature of her interest—without exactly volunteering the fact that she happens to be a labor organizer. Next, she visited the exhibit of another company, Kronos, this one topped with a gigantic, 007-style silhouette of three workers wielding mobile devices instead of pistols. Beneath them, the display proposes: “Your secret weapon for growth. ASSOCIATES.” Gleason continued her line of questioning. In the back end of the Kronos system, she could see the top-level screens where human-resource directors set certain basic parameters: How long can the shifts be? How strongly should the workers’ preferences be considered? She asked about the reports that the system can generate. Never before has it been possible to get such good, easy data on employment practices. Enforcing labor laws could be a breeze. After the presentation, Gleason asked more questions and nodded to the answers. Yet, privately, she didn’t share Bernick’s optimism. This technology certainly can be a force for worker justice, but she knew too well how, by and large, it is actually used. The previous November, Gleason had been in Washington, testifying at a congressional briefing about how unpredictable schedules and permanently part-time jobs have created a crisis for workers across the United States. As director of the Fair Workweek Initiative at the Center for Popular Democracy, she is one of the people orchestrating what may be a historic change—and comeback—for the labor movement. Along with wages and conditions, hours used to be a basic concern in worker organizing. During the heyday of the struggle over hours, in the century before World War II, the demand was always for fewer of them. The “Lowell Mill Girls” agitated for a 10-hour day, and the Haymarket strikers wanted to get down to eight. But since the Fair Labor Standards Act of 1938 enshrined the 40-hour week, hours have tended to be taken for granted. Time was regularized, and thus depoliticized. This is changing only because, in recent years, employers have entered a devastating new race to the bottom: Involuntary part-time is becoming the new norm for low-wage workers, together with schedules so unpredictable and varying that one can’t easily get another job, or go to school, or be a reliable parent. Now, as a new national movement about work hours gets going, it has focused on more rather than fewer, and at more regular intervals. University of Chicago professor Susan J. Lambert, a collaborator of Gleason’s, is the leading authority on the numbers behind the crisis. Her research has found that 41 percent of early-career hourly workers—people in their mid-20s and early 30s—learn about their schedules a week or less in advance; for African-Americans, it’s 49 percent. Only one in five of these workers has a significant say in when their shifts will be. The hours worked by part-timers in a given week fluctuate, on average, as much as 87 percent. The ingredients of economic crisis, corporate competition, and technology have created “a perfect storm,” Lambert says. During the commute, he tries to do homework, but it’s hard to concentrate on the bus and train. He usually ends up listening to music, or thinking about making his own music at church or with friends. When he finally gets to SoHo, he puts on his uniform, a form-fitting suit and tie. These suits were part of what first drew him to Zara; it seemed like a place where he could learn more about what it means to be a professional. “From the outside, it looked really good,” he says. Zara is the chief brand of the Spanish company Inditex, a vertically integrated manufacturer, designer, and retailer specializing in getting new lines from sketch to store faster than the competition. Its founder, Amancio Ortega, is the world’s fourth-richest person. There are still only a few dozen locations in the United States, but that number is growing quickly. Zara prides itself on responsible labor practices, and many of its European workers have unions. It’s not the worst of the worst in New York City fashion retail, by any means: The pay starts above minimum wage. But Zara has made a habit of unpredictable schedules. And in this case, technology doesn’t appear to be to blame; workers’ schedules are posted the old-fashioned way—on a sheet of paper in the stockroom. By the time he got involved last summer, the Zara campaign was already up and running. Conversations between organizers and Zara workers started back in 2013. 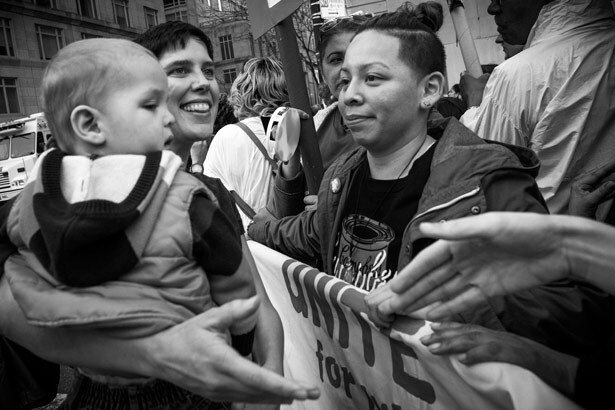 In the spring of 2014, Dolly Martinez, who had helped form a union at her Utrecht art-supply store, spent a month standing outside the Zara location at Bryant Park. She was an organizer in training with the Retail Action Project (RAP), an arm of the RWDSU that helps workers build campaigns for change in their industry. At last, Martinez met a Zara associate named Sharlene Santos, who started enlisting her coworkers around grievances like favoritism, lack of full-time positions, and unpredictable schedules. Organizers at RAP and RWDSU agreed that, with some pressure, Zara might be the company that helps them turn the tide of the scheduling crisis. It represents a fast-growing part of the industry, and it has a reputation for ethical policies to protect. 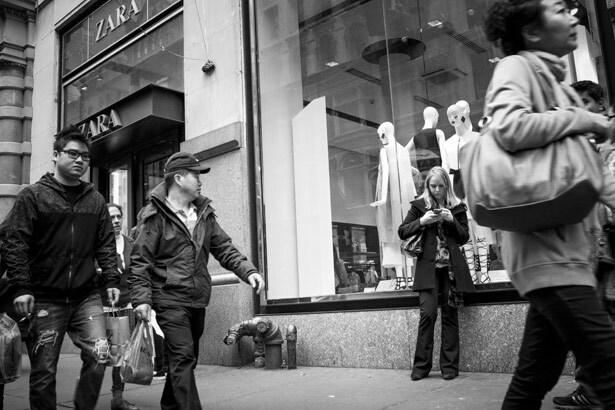 Beginning in May 2014, workers at Zara stores throughout New York City began presenting petitions to their managers. Some workers visited their counterparts in Spain, as well as Inditex headquarters. “You screwed up for everybody,” some coworkers told him. Others simply kept their distance. Labinjo started applying for other jobs, but without success. Now he thinks that might be for a reason. The main meeting room at the Retail Action Project’s office in Midtown Manhattan is drab in the way that union offices just about always are. Four rows of fluorescent lights and four white ceiling fans are arrayed over the gray, speckled carpeting. There’s a generous supply of folding chairs and folding tables and water jugs. A mannequin wears a shirt from a past campaign, and old posters lean against the walls. The office sits one floor up from 31st Street, next to a firehouse; above it is the RWDSU local for the famous Macy’s store in Herald Square, which is just a few blocks away. This room is where RAP’s Eno Awotoye leads classes for retail workers, covering subjects like customer service and visual merchandising, along with generous helpings of “Know your rights” and Unions 101. 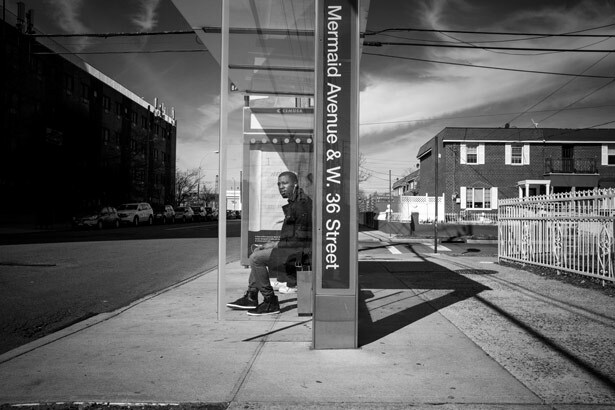 Awotoye, an artist born in Nigeria, testifies to another era of retail. She began working at the Herald Square Macy’s over two decades ago. “We didn’t have the amount of turnover or the amount of attendance issues that we have now,” she says. “People loved their jobs. They wanted to be there.” She remembers when on-call shifts existed mainly for retirees who liked to pitch in at the store from time to time; it was voluntary, not the rule. Even now, thanks to the union that Herald Square workers joined in 1939, employees have far more control over their time than their nonunion counterparts in Downtown Brooklyn. Both stores use the same software, My Schedule Plus. RAP first came to terms with the scheduling crisis in 2011, when it conducted a study of the city’s retail workers with City University of New York sociologist Stephanie Luce. “While part-time is an attractive choice for some workers,” the report concluded, “this explosive growth of part-timers is because of underemployment, not because of worker choice.” Even as employers cut hours, they were hiring new workers, feeding employment numbers and giving themselves a larger part-time pool to draw from. RAP ran campaigns around the hours at Abercrombie & Fitch, Juicy Couture, and Victoria’s Secret before turning to Zara. For the first few weeks, they practiced organizer/worker conversations with one another, and then they started going to the stores and talking with actual workers. (“Use your personality,” one handout read in bold type. “People get involved because they like you.”) They joined a rally outside City Hall supporting a strike by fast-food workers, and they sang inside a Utrecht store undergoing contract negotiations. One of the students, a recent college graduate from the South, joked with Labinjo about his “squeaky-clean image.” But all the while, he and his coworkers continued pressing their case at Zara. On December 15, Zara retail workers across the country received a letter announcing a new pay scale, which amounted to a raise of from $1 to $3 per hour. Full-time jobs would become more available for those who wanted them. 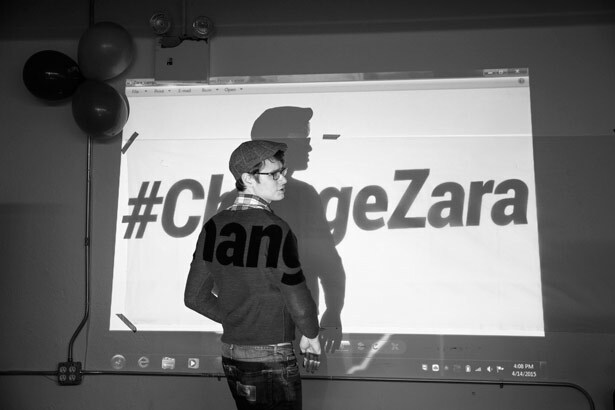 Zara attributes the changes to a routine annual review and declines to comment on its cause; the letter itself boasted, “We have very ambitious plans to enlighten the American market with our wonderful company.” But for Labinjo, his coworkers, and the organizers at RAP and RWDSU, it was a victory. For one thing, the coworkers who before had given Labinjo the cold shoulder were now patting him on the back. “Never in a million years did I expect that I’d come this far doing organizing,” he says. But he insists that the raises, as well as the end of on-call scheduling that they’d won a few months before, aren’t enough. It needs to be on paper, in a contract. 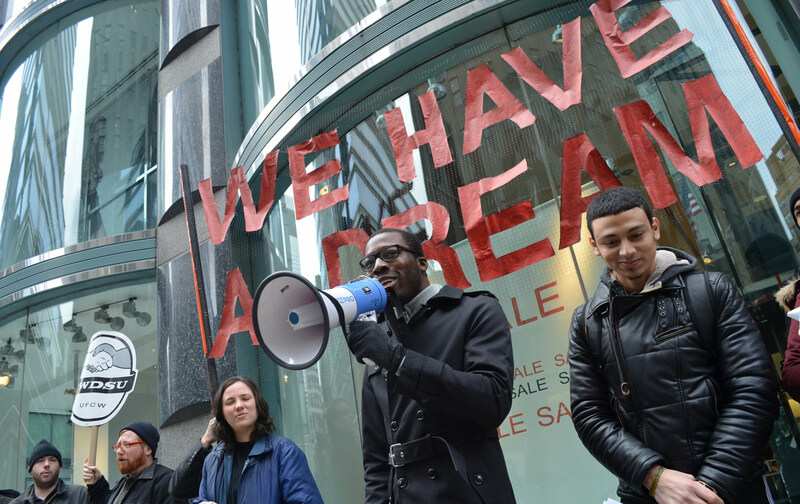 On Martin Luther King Day, RAP’s organizers in training helped organize a rally at a Zara location on the Upper East Side. From inside the store, Labinjo led a chant: “Zara, Zara, please be fair—we work hard, we want our share!” Alongside him were workers from a distribution center in Massachusetts that Zara relies on—people in a position to cause much more disruption to the company’s prized supply chain than any retail worker. The previous month, they had delivered a RAP petition to their own manager. “We envision this as a campaign that has barely started,” says Phil Andrews, director of the RWDSU’s Retail Organizing Project. Twenty years ago, “flexibility” was considered a good thing, a desideratum for working mothers gaining a foothold in workplaces designed for sole-breadwinner men. In the intervening years, however, the flexibility discourse that had been developed to meet the needs of white-collar workers, especially women, has been turned against blue-collar workers, especially women. “Flexibility,” and control over what it meant, became the privilege of employers, not employees. “The corporations and employers seized on work flexibility and rebranded it,” says sociologist Naomi Gerstel of the University of Massachusetts, Amherst. With fellow Amherst sociologist Dan Clawson, Gerstel recently completed a study of the inequalities of scheduling among hospital workers. “Certainly the nurses we talked to tend to think of ‘flexibility’ as a curse word,” Clawson says. Liz Watson of the National Women’s Law Center, also in Washington, helped steer a policy response in the form of the Schedules That Work Act, a bill that was introduced last year in the House of Representatives by Congressman George Miller. (The Senate version was cosponsored by Senators Elizabeth Warren and Tom Harkin.) It didn’t pass back then, and now, with a Republican-controlled Senate, its passage is even less likely. But the bill has provided a baseline for state- and city-level efforts. Its provisions include penalties for last-minute shift changes by employers and the right of workers to make scheduling requests without fear of reprisals. When Carrie Gleason moved from RAP to the Center for Popular Democracy early last year, she set to work coordinating local campaigns around model legislation. (Her bill sets a standard of three weeks’ notice.) Now she’s tracking working-hours bills in about a dozen states, including Connecticut, Maryland, Massachusetts, and Minnesota. In the Bay Area, two proposals passed at the end of last year—a living-wage rule for county workers in Santa Clara County, which includes guidelines for scheduling, and a Retail Workers Bill of Rights in San Francisco, which carries penalties for large companies that rely on part-time, on-call labor. Other states and cities are on the way. Many of the organizations that have been leading campaigns for higher wages among retail and fast-food workers have made “just hours” their cause as well. Stories about the worst abuses have resonated enough to escalate into scandals. Last August, a day after The New York Times published an article about how Starbucks’ scheduling policies affected a single-mother barista, the company abruptly changed course—and the entire retail industry was put on notice. A later Times article that featured the Zara campaign focused on “clopenings”: when a worker is expected to close and then open a store in sequence, leaving little time for sleep in between. Such reports have tended to highlight the role of software, raising the possibility that the scheduling crisis may just be a momentary glitch in the programming. The programmers’ path is paved with good intentions. Chad Halvorson, the founder of WhenIWork.com, first had the idea of creating a scheduling platform more than a decade ago, when he wanted to take some of the annoyance out of an hourly job at a grocery store. He remembers thinking, “Man, if I could just check my schedule online, that would save so much headache.” His software now schedules employee hours at companies like Walgreens and Ben & Jerry’s, and he hopes to have provided workers some of the relief he longed for. Scheduling software, irregular shifts, and multiple part-time jobs are not in themselves bad things, since they can lead to a much-improved working situation for many—one in which workers can plan their lives to suit their interests and responsibilities. Flexibility, in short, can still be salvaged—but it all depends on who is in control, and whose flourishing is taken into account. Even the smartest devices still do pretty much what their designers intend; if managers want to use scheduling software, maybe workers should have a say in how it works and access to its data. When Jedidiah Labinjo talks about what first disturbed him at Zara, it’s worth noting that he doesn’t begin with hours, or schedules, or even wages. He talks instead about respect. “They tried to make me be robotic,” he says. “I’m not going to be robotic. I’m an individual.” This is where it all began for him; that’s why he got involved in the fight over hours. There’s a poster in the RAP office that reads We need #SchedulesThatWork so we can: The sentence remains unfinished, followed by a blank space. That blank, and what each of us would put there, stands for the time that makes us more than just workers.